There is a lot of discussion surrounding protein in the fitness world, with "which kind is best" being one of the more common topics. Most people assume that animal-based proteins are the best, but these athletes swear by their vegan diets—and their impressive physiques make a good argument! Ironman triathlete and bodybuilder Dominick Thompson is an accomplished athlete and animal rights activist, who is practicing some serious dedication in both the fitness arena and in the kitchen. During a 2017 podcast interview, Thompson opened up about his rough childhood and the path that led him from prison to sponsored athlete. Thompson, who grew up in West Side, Chicago, was exposed to crime and gang activity from a young age, ultimately leading to his incarceration at the age of 21. His first week in prison left him struggling to make sense of his situation, stating his involvement in gangs was "…pushing poison into people's communities." After some serious reflection, Thompson vowed to give up meat as a redemption, of sorts, also citing his lifelong connection with animals. In an interview with the Discerning Brute, Thompson states he is stronger now as a vegan, and feels his strength training has noticeably improved since omitting animal products from his diet. Pre-workout, Thompson consumes fruit juice and berries, and brings juiced watermelon to rehydrate during an extended session. He's an avid juicer, and prefers simple, natural options over processed, complex meals. Each week he trains via CrossFit, boxing, cross-training, running, swimming, cycling, weightlifting, powerlifting, and calisthenics. In 2014, Thompson trained an impressive 120 hours per month in preparation for his next Ironman, on top of working a 9-to-5 job as a healthcare executive. Today, he is the founder of Iron Brukal, a sports brand dedicated to the working professional. He also established the successful startup company, Crazies and Weirdos, which launches a new clothing campaign every three months, with the proceeds going to various animal rights organizations. Follow Thompson on Instagram @domzthompson and get motivated by his compassionate lifestyle and insane workout regimen! Simon Hill is a 30-year-old millionaire entrepreneur and graduate student studying nutrition. He transitioned to an entirely vegan, whole-food diet in 2016, and hasn't looked back. Hill practices intermittent fasting, restricting calorie consumption to 8 hours per day while fasting for the remaining 16. If his toned physique is any indicator, it seems to be working in his favor. Hill believes fitness is a balance of both diet and exercise, but maintains that the key to staying lean is following "…a healthy, balanced whole-food diet." Hill's typical daily diet is packed with fresh veggies, berries, oats, fats from avocados or nuts, proteins from tempeh or soy, and loads of hemp seeds. Hill also enjoys sweating it up both in and out of the gym. These days, he only does moderate lifting at the gym 3-4 times a week, and keeps core-specific training to 2-3 times per week. He's big on outdoor beach workouts, and spends the remainder of his sessions doing soft-sand runs, calisthenics, and bodyweight training. He also gets his cardio on by doing what he refers to as an "in and out," which uses water resistance to get the blood pumping and is essentially a short sprint to the shore from waist-deep water. You don't need to be an aspiring vegan to get motivated by Hill's protein-packed, plant-powered diet. Follow him on Instagram @plant_proof and put a little love back in your kitchen! Professional bodybuilder and lifelong athlete Torre Washington has been dedicated to an entirely natural, plant-powered diet for the past two decades. Since his competitive bodybuilding debut in 2009, he has achieved multiple first-place victories, including the SNBF Open in 2009 and the WNBF Naturally Fit show in 2013. He has also received nationwide recognition for his commitment to animal rights, and was awarded the Humane Hero Award by the Florida Humane League in 2016. Washington, a native of Alabama, was primarily raised vegetarian by his mother, although he began eating meat again while spending a few years with relatives in Jamaica. Ultimately, he discovered the Rastafarian "Ital" diet, a predominately vegan diet that focuses on naturally sourced, non-processed foods. In 1998, he officially committed to an entirely plant-based diet. Despite his success at a competitive level, Washington admits he still faces pressure to eat meat or consume whey protein shakes to bulk up. 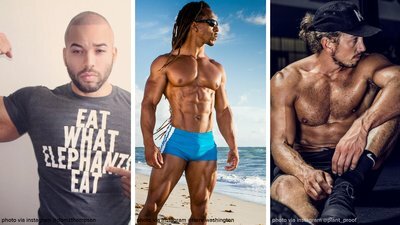 As an all-natural bodybuilder, Washington builds muscle through a balance of nutrient-rich, plant-based foods and effective workout regimens. His weekly training may seem moderate at about 5 hours per week, but he dominates each session with high-intensity exercises. He also generally favors deep squats, stiff-legged deadlifts, bent-over rows, and heavy shrugs, and attributes his quick recovery time and ability to stay lean to his vegan, whole-food diet. To ensure he stays lean year-round, he keeps his meals consistent and simple with plenty of fresh, nutrient-packed foods, such as sweet potatoes, lentils, broccoli, and grapefruit. Currently, Washington holds a coaching certification with the National Academy of Sports Medicine, and is determined to use his personal success to inspire others to achieve their goals. Follow him on Instagram @torre.washington, or check out his website for health and fitness tips from a bodybuilding pro!